Maruti Dzire price in Mumbai starts from Rs. 5.69 lakh (Ex-showroom). Dzire is available in only 14 variant. Maruti Dzire's top competitors are Maruti Baleno (price starting at Rs. 5.55 lakh in Mumbai) and Honda Amaze (price starting at Rs. 5.86 lakh in Mumbai). Q. I want to buy new Maruti Dzire which is the best model for me, my budget is around 7 lakh. Q. Which is economic to go LXi or VXi? Q. 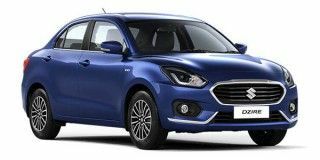 Which have low maintenance cost in long run between Xcent SX and Switch Dzire VXI? Q. Which car is safer for my family with in 5-6 lakhs? Dzire is a complete family car with 2 airbags ABS EBD and brake assist as a standard safety features. It has a comfortable ride quality. Q. Yearly Maintenance in diesel dzire? Confused about Maruti Suzuki Dzire?